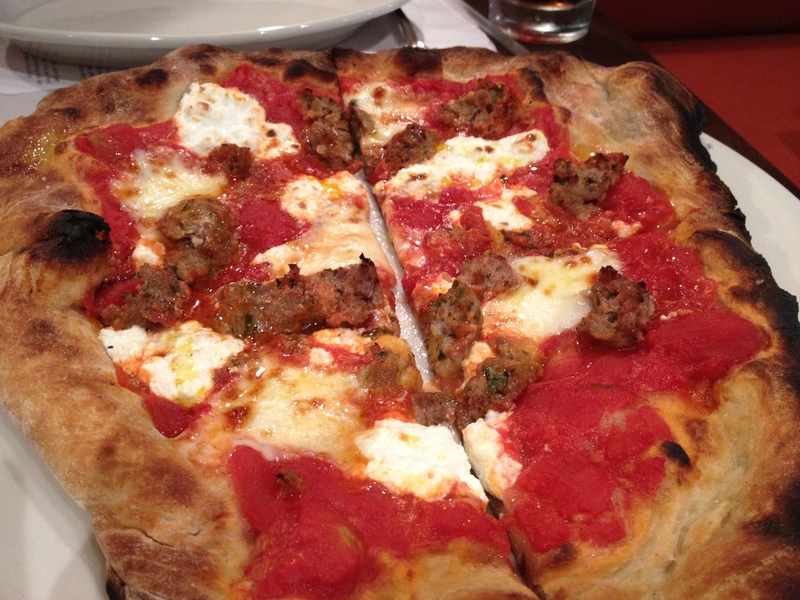 Meatballs, ricotta, mozzarella and tomatoes top the coal-fired pizza. Despite the fact that Providence made it to number three on Travel and Leisure’s Best Pizza in America list, I’ve remained largely disenchanted with my local slice options. For me, all pizza will always be compared to the thin-crusted tomato and fresh mozzarella pie at Mario’s on Arthur Avenue, where my grandmother has been eating for over half a century. As a result, Nice Slice, Fellini, and Caserta Pizzeria have left me unimpressed. Of course, the grilled pizza from Al Forno and Bacaro are well worth the trip, but both of these are more special occasion pizzas (Al Forno doesn’t do take out; and Bacaro makes a more gourmet pizza). They simply don’t satisfy the urge for the casual, classic New York pizza I grew up on. So yesterday, when Geoff walked by the new Providence Coal-House Pizza in Downcity, he called me and I came down immediately with the kids to sample it. Their custom ovens heat pizzas to approximately 900°F — much higher than traditional or wood fired ovens — which embed the pizza with a delicious smoky flavor. We tried both the margherita and meatball. My favorite was the meatball — the combination of melted ricotta and homemade meatballs worked well; Geoff preferred the margherita. Although I typically abandon my crust, I ate it all — which says a lot. No, it’s not Mario’s, but I can honestly say this is now officially my go-to local pizza joint. I will have to try them soon. I love Pepe’s in CT. I should mention that any good wood fired pizza is baked at approx. 900 degees as well. There is a lot of substandard “brick oven” pizza baked at 400 degrees in fake wood fired ovens but the real deal Neapolitan style is available in RI if you want it. Hey are you the ones that set up your pizza around Providence for special events (like WaterFire) — if so I love your pizza! Added to our must-try list! I, too, am on the hunt for good pizza in Providence. Al Forno will do a takeout pizza if the kitchen isn’t too busy, but it doesn’t travel well and at $25 a pie, not practical for a casual night at home. Thanks for the lead to Providence Coal Fired. I’ll try it next.